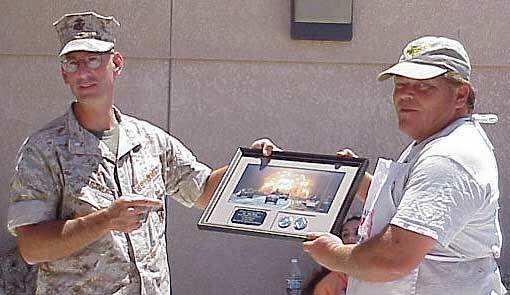 "Operation BBQ for Our Troops"
June 18, 2004, at the 29 Palms Marine Base. 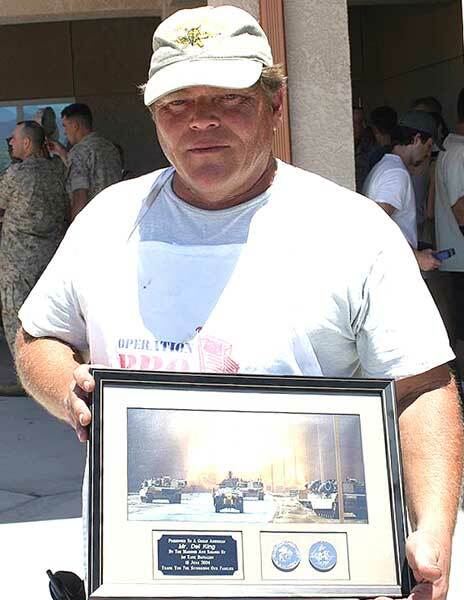 A write-up by Del King, an "After action report"
Close-up of Del and Plaque Del getting his "just dues" and being interviewed by "Food TV"
Another successful "Operation BBQ for Our Troops" event was held June 18, 2004, at the 29 Palms Marine Base. 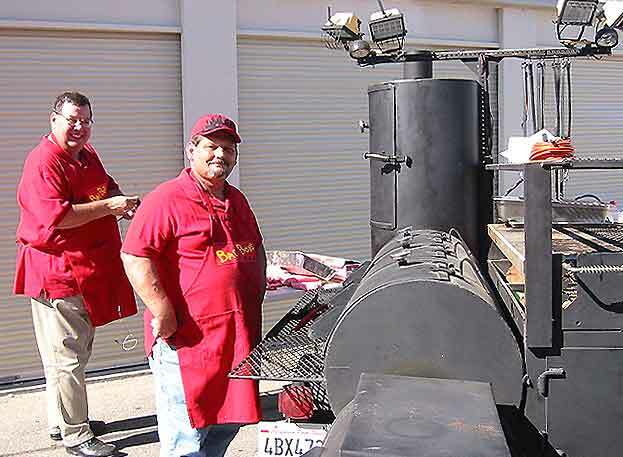 Approximately 30 CBBQA members and supporters rallied to feed over 300 Marines and their families some Texas-style brisket, pulled pork, chicken, hamburgers, and hot dogs. 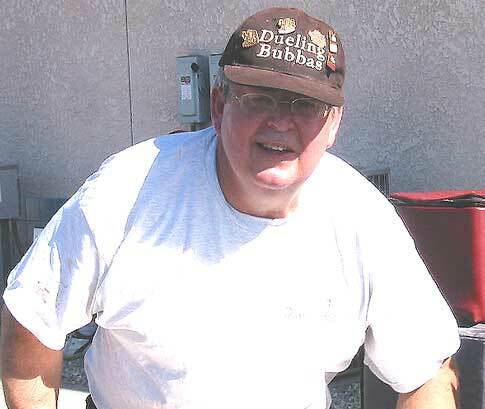 Several teams, including Del King’s Taste of Texas BBQ, Don Grissom’s Duelin’ Bubbas with Dr. Don Iverson, Tom Chilton’s Mojave Hot Stuff BBQ, Randy Gille and Don Carpenter’s Burbank Bad Boys, and Bentley Meredith spent the night cooking the briskets and butts. 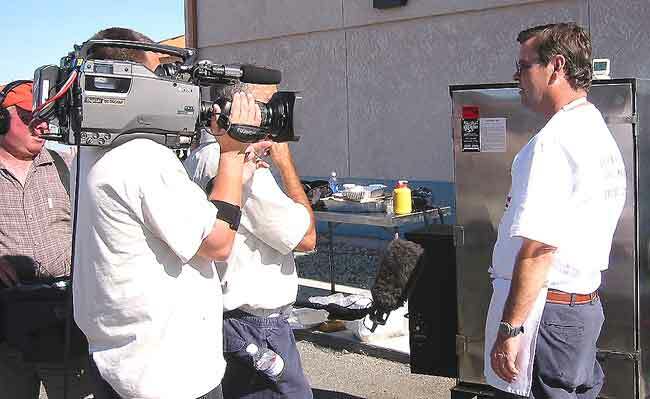 A film crew from the Food Network show "BBQ with Bobby Flay" was on hand to record the events. 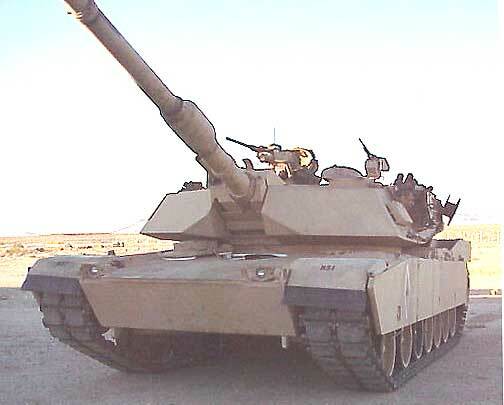 Friday morning dawned with a rumble and a roar as an M1A1 Abrams tank and a tank recovery vehicle pulled into the area. Manning the tank recovery vehicle was the Marine who pulled down the statue of Saddam Hussein using a similar vehicle. 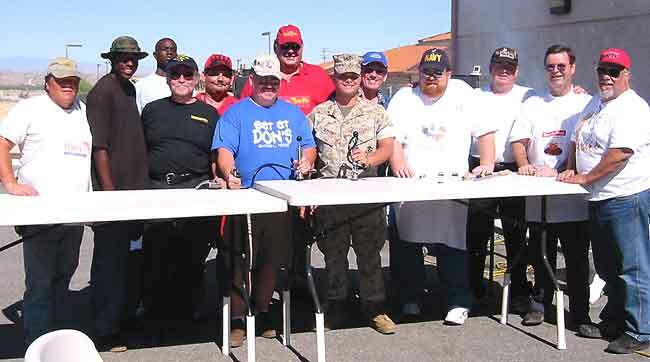 Several more CBBQA members arrived to help with slicing and preparing the meats, including Todd Eves, Rick Streiff, Dan Cannon, Brent Walton, and the ROTC students from Long Beach. 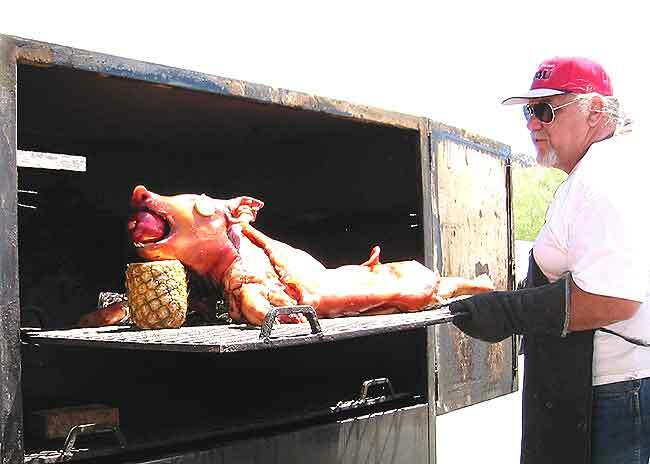 Also, Smokin’ John and Flaming Linda arrived with a beautiful whole pig which was presented to the battalion commander. Of course, no BBQ event is complete without some drama, so Tom Chilton had a pit fire in his FE-100. Dr. Don accused him of operating a crematorium without a license. 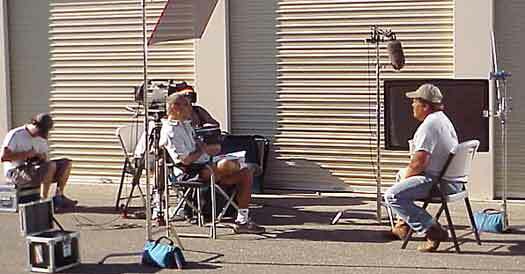 Todd Eves asked him if he was really so desperate to get on television that he’d burn up his pit. Although a load of chicken was lost, there were no injuries and no permanent damage to the pit. 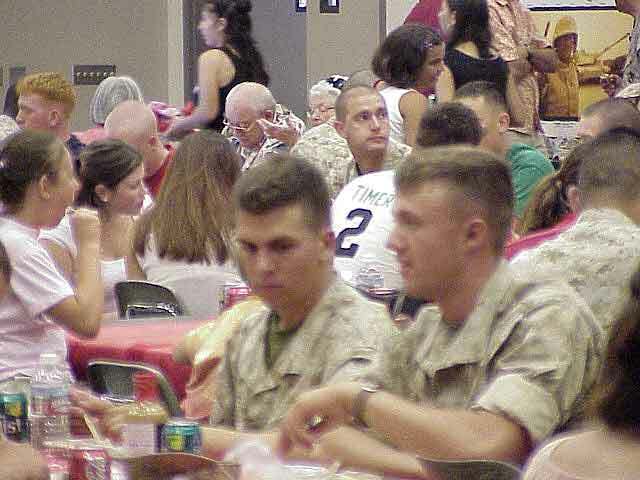 The Marines and their families arrived, and the real pay-off to all the hard work was seeing them enjoying the BBQ. The Battalion Commander presented Del King with a plaque and made a heart-felt speech expressing his gratitude for this and the other BBQ’s we’ve done for them. This was another great event and we can be proud that the CBBQA was part of it. Other sponsors of the event were BBQ’n Fools, who contributed their BBQ sauce and Signature Rub, and Out of This World BBQ Products, who also contributed rubs and seasonings. right through our cook area. arrived with his Trager and started to set up. were cooking the whole pig. that were warm and waiting. see some many different type of cookers. did and how well they came out from a pellet pusher. other staging area to get their needed sleep and rest. too many Dons at this event) and Randy's son arrived. The Marines had brought over cots for use to use. stopped and it was calm for the rest of the night. kind used to pull the statue down). the drivers seat and then tour the rest of the Tank. in my allowance as the 50 cal moved back and forth. motion with the mess Gunny getting ready to serve. whole pig as a gift from his men and their families. This man was so touched it brought a tear to his eye. should be presenting something to his great men. and he declared this pig fit for eating. lines and the serving started. kept on the cooks about it must be moist and tender. their product in at a contest it was moist and tender. stressed out counting the number of pans of brisket. few plate full left for to go containers. and the CBBQA and all the donors.